Each winter Allées de Tourny is transformed in to a charming Christmas village with over 130 wooden chalets serving up holiday favorites like roasted chestnuts and mulled wine (vin chaud here in France) and selling wares from artisans all over the Aquitaine region that make the perfect Christmas gifts. 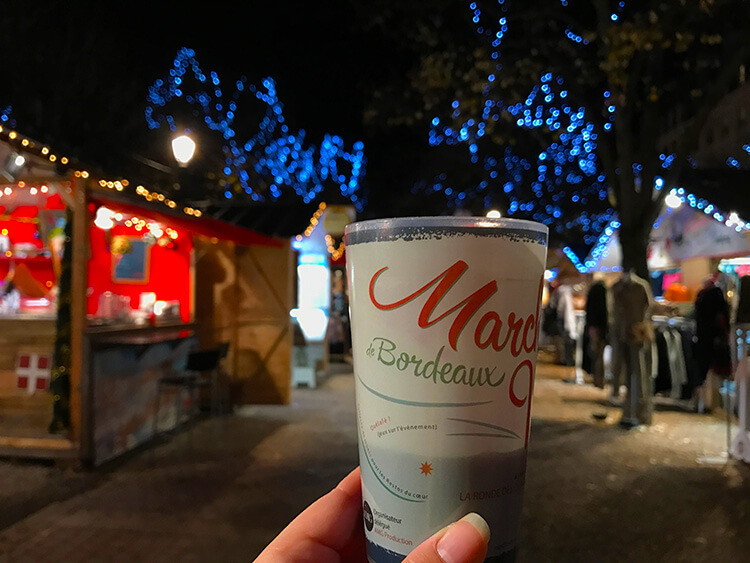 I live just a two minute walk from the Marche de Noel Bordeaux, so after nearly a month of almost nightly visits I’ve gotten to know this Christmas market like no other before. I know Christmas isn’t supposed to be about festive holiday displays. I grew up celebrating Christmas as both the birth of Jesus and with Santa, reindeer, holiday lights and all the hoopla. And when we moved to Italy, it was the time of year that I missed the US the most. I deeply missed the brightness and joy entire neighborhoods decked out in their holiday finest bring when this time of the year is plunged into so many hours of darkness. I missed ABC Family’s 25 Days of Christmas with all the cheesiest holiday movies playing on an endless loop. I missed the Radio City Rockettes with their high kicks and sparkling costumes performing all the holiday classic songs. And most of all I missed picking out our Christmas tree from a stand selling the prettiest Blue Spruce and Douglas Firs the day after Thanksgiving. Italy is a place where Christmas is about the birth of Jesus. There isn’t much of the commercialized hoopla. Putting up a Christmas tree isn’t even a common thing and houses certainly don’t compete for who can out-light the rest of the block. To combat my deep depression that would set in at this time of the year, I’d drag Tim to as many Christmas markets as I could squeeze in to a holiday season. We even drove to Nuremberg in a blizzard for a weekend. Italy’s Christmas markets are just disappointing; Venice’s was a pitiful little market with a few booths set up under tents selling salami, cheese and pastries. There was mulled wine, crepes and an ice skating rink but you’d hardly even know it was Christmas. The most festive place to get me in my holiday spirits was Ljubljana’s Festive Fair, nearly an hour and a half drive away in another country. I excitedly watched as the little wooden houses were built over a few weeks and finally the Marche de Noel opened on the first Friday of Advent, as is customary for most European Christmas markets to open. Some 130 chalets stretch up and down Allées de Tourny in little rows and artisans from around the Aquitaine region are mixed with a few international vendors from places like Russia and as far away as Canada. I was super excited to see the big Canada chalet. I grew up less than two hours from the Canadian border and I couldn’t resists buying some Canadian maple syrup, maple fudge and those delicious maple cookies that are basically like Oreos but with a filling made from maple. 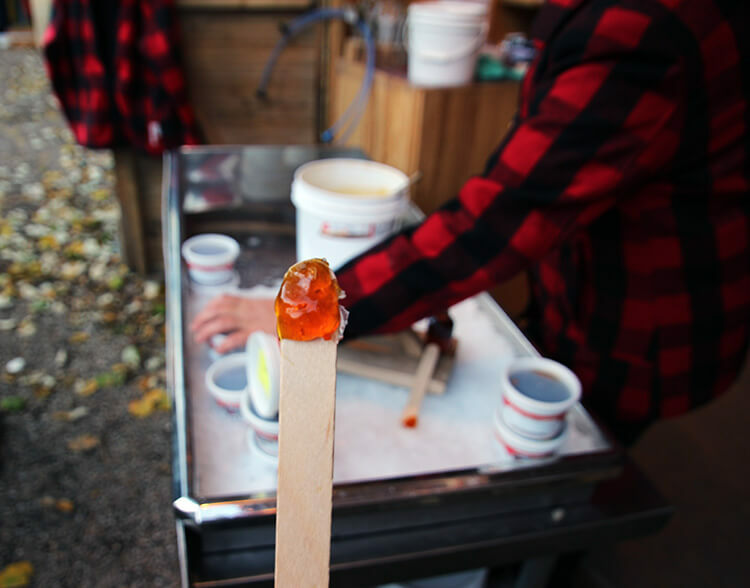 I was also thrilled to see the Canadians making maple taffy! If you’ve never drizzled maple syrup on the snow and let it freeze to a taffy-like consistency, you are seriously missing out. 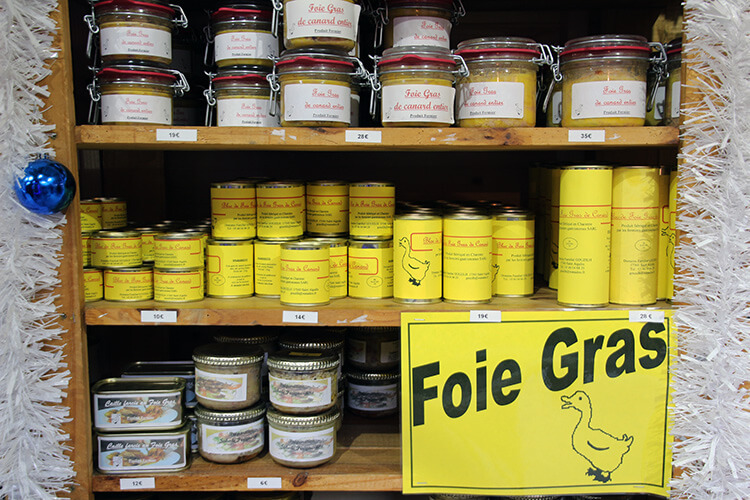 Of course, you can find Aquitaine specialties like chocolates from Bayonne (the European town that invented chocolates after the Spanish brought it back to Europe), canelés, Armagnac (a spirit that is delicious poured over canelés, by the way) and more types of foie gras than you could have ever even imagined existed. While I typically pick up Christmas decorations like the ornaments we collect for our tree, here at the Marche de Noel Bordeaux I found more of a selection of unique gifts that I could send home for family from handcrafted jewelry to beautiful scarves (a French essential!). And there is a lot of good food to eat! 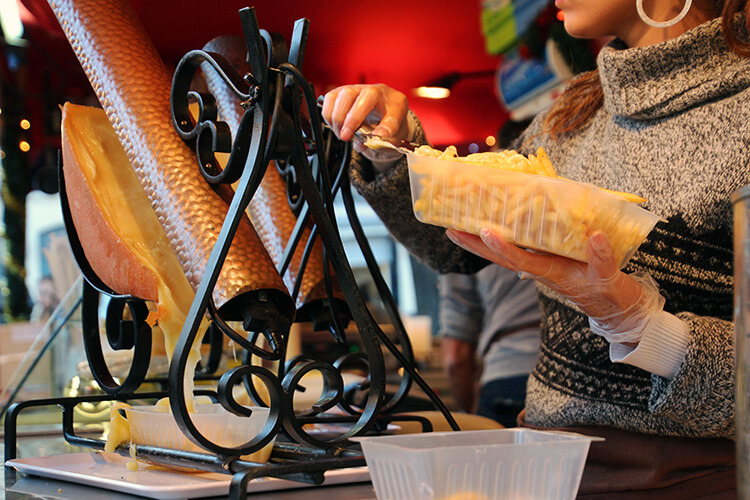 You can find the sausages typical to every Christmas market, though these come from the Alsace region of France. Actually, there’s even a stand selling Manhattan-style hot dogs. 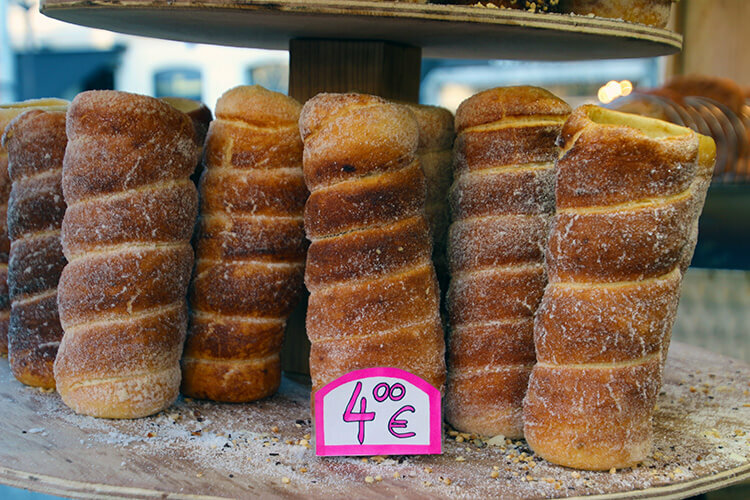 There’s also kurtoskalacs, the traditional Hungarian spiral pastry known as chimney cake at a little stand from Hungary or pasta bolognese from a food stand from Italy. I can’t seem to stay away from the Savoy stand, where they have traditional grills that melt the wheel of cheese and it’s served on french fries. Honestly, it’s a good thing the market is only open for a month because there is just too much good food easily accessible with the Marche de Noel being down the street. 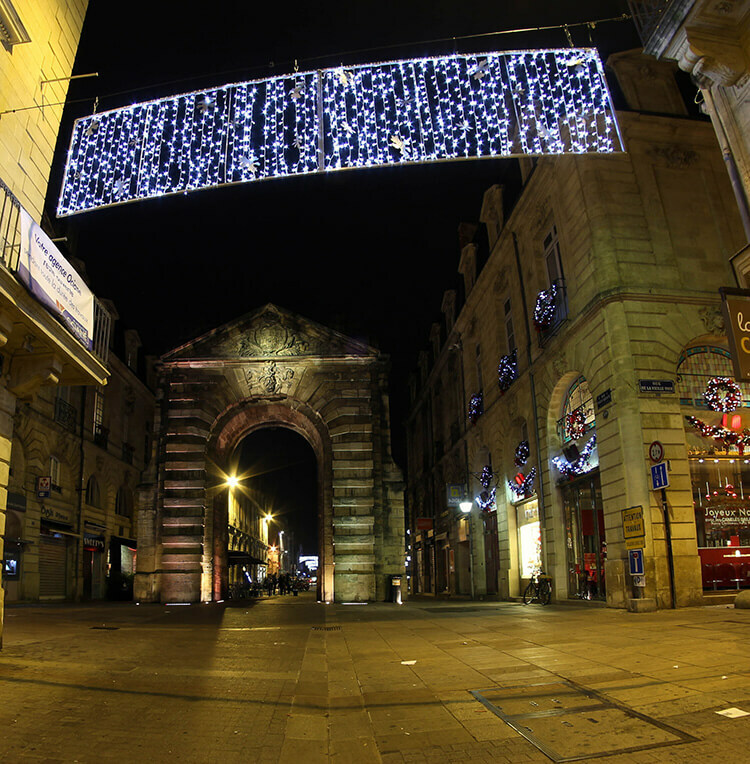 I combat all the raclette and french fries with nightly walks to see Bordeaux all dressed up in her holiday finest. From the Marche de Noel, wander over to Place de la Comedie to see the twinkling InterContinental Grand Hotel. I think it’s the prettiest and most decked out spot in all of Bordeaux with the waterfalls of cascading lights glittering like diamonds. Be sure to also stop inside. 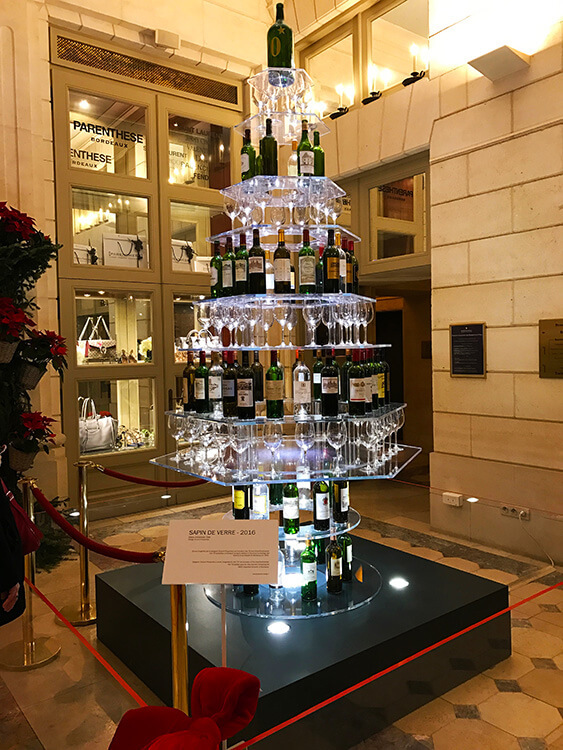 This year is the 70th anniversary of the hotel and the main Christmas tree is made from 70 bottles of wine from the 1855 classification of wine. You can also see Chef Fevré’s masterpiece on display: a bûche noël (a traditional Christmas yule log cake) that took six months to shape in to a replica of Place de la Bourse. 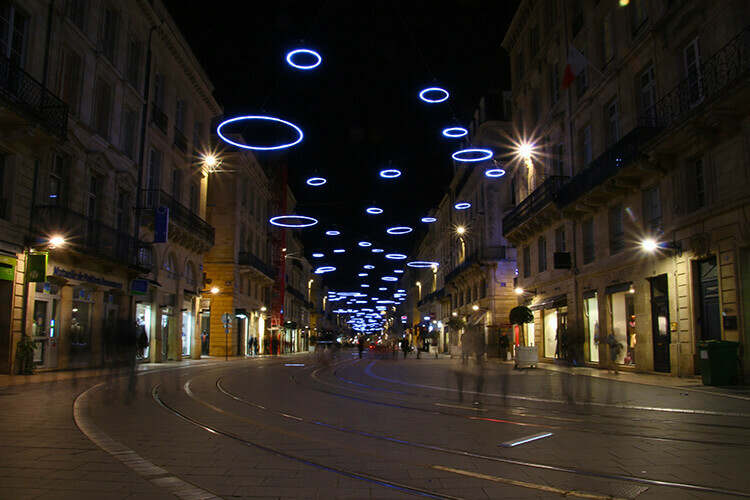 Wander up Course de L’Intendance under the blanket of circles, then under the stars of Rue du Temple to the chandeliers adorning Rue de la Porte Dijeaux. 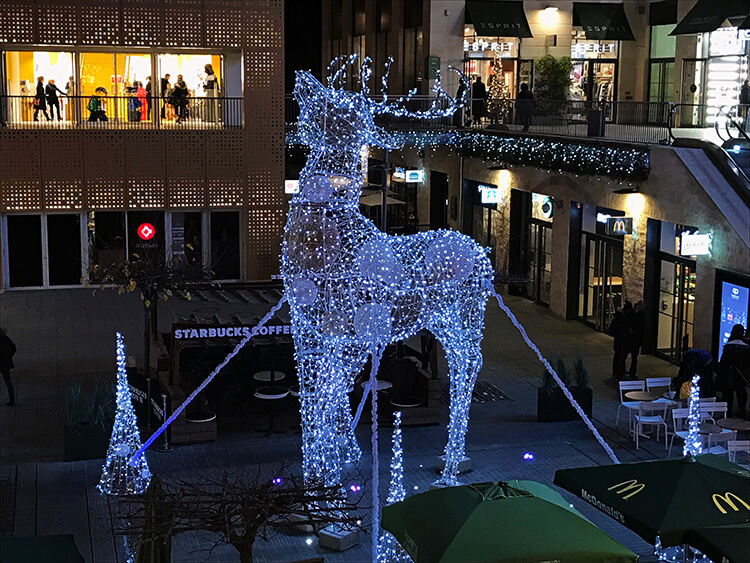 Detour in to Promenade Saint-Catherine to see the larger than life reindeer before heading down to the swags of lights dressing up Rue Saint-Catherine, Europe’s longest pedestrian shopping street. 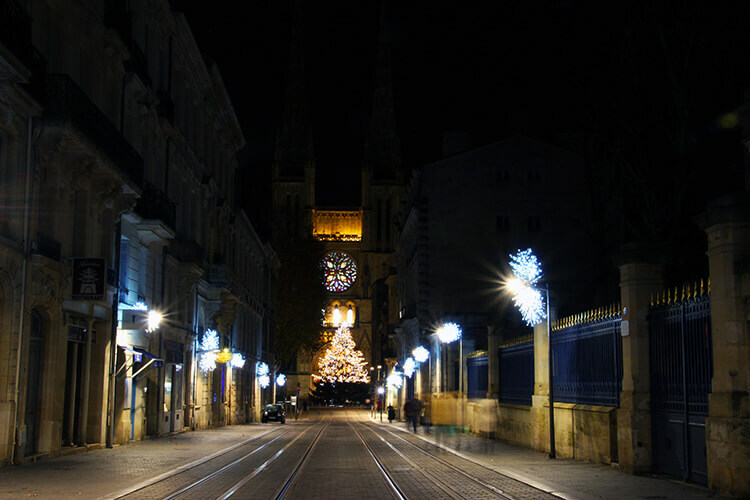 End your Christmas light tour at Place Pey Berland to admire the massive Christmas tree in from of the beautiful Cathedral Saint-Andre. Marche de Noel is easily reached from the Line B tram to the Grand Theater stop or Line A, B or C trams to the Quinconces stop. 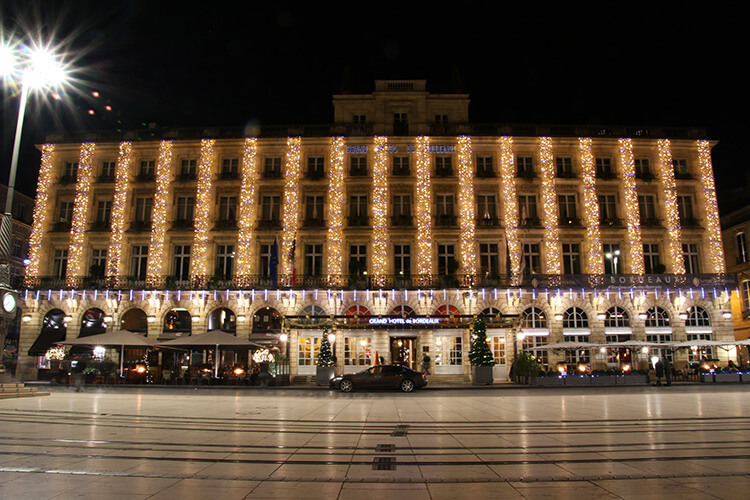 Stay at the InterContinental Grand Hotel Bordeaux, which is steps away from the Marche de Noel. Mama Shelter and Le Boutique Hotel are also centrally located hotels we recommend. Wonderful post. it leaves me a hungry!! I’ve heard such awesome things about France’s Christmas markets and now I can see why. 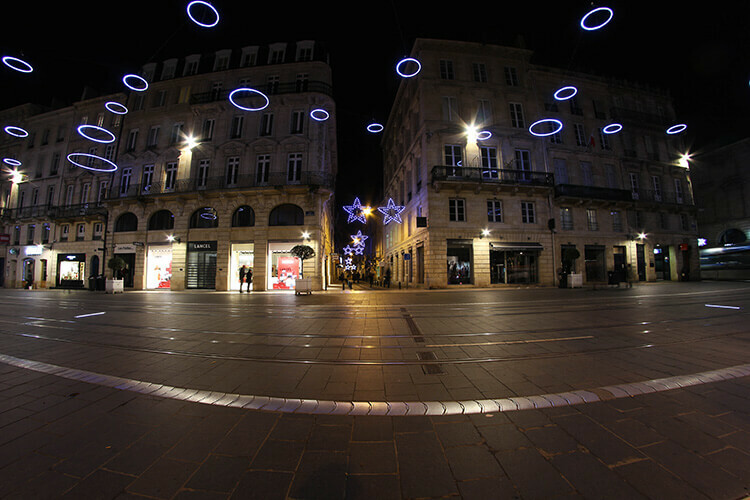 Bordeaux is clearly a good choice if you’re looking for a festive Christmas atmosphere. I’ve never really been into Christmas much because it’s just too commercial or religious. But I do love gluhwein and really amazing winter foods! I just returned from a Viking Christmas Markets cruise, Jennifer, where we explored markets all along the Rhine. I enjoyed observing the shades of difference between French and German markets, such as the vin chaud blanc and gluhwein. I found it interesting in your article that Bordeaux markets have raclette. I did not see raclette in Strasbourg and Colmar during my trip, only in Swiss and German markets. wow, what a great Christmas market. There is something special about Christmas markets in Europe. They are the best way to get in the holiday spirit. 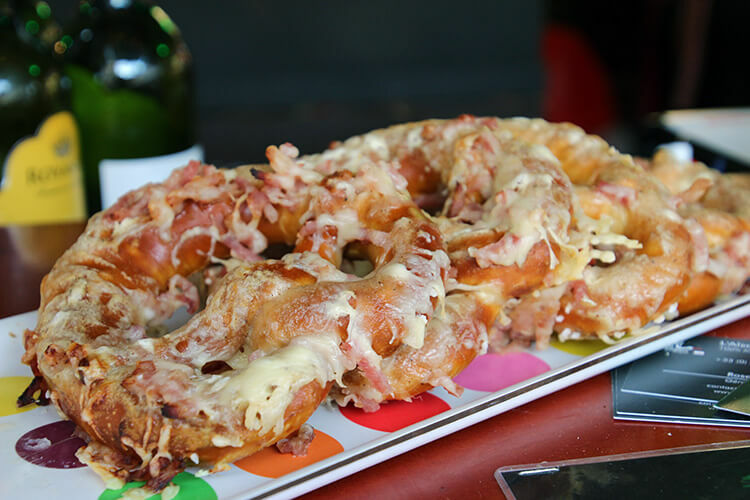 A little mulled wine, and a few plates of those frites with raclette, I’d be ready for Christmas! You’re right. 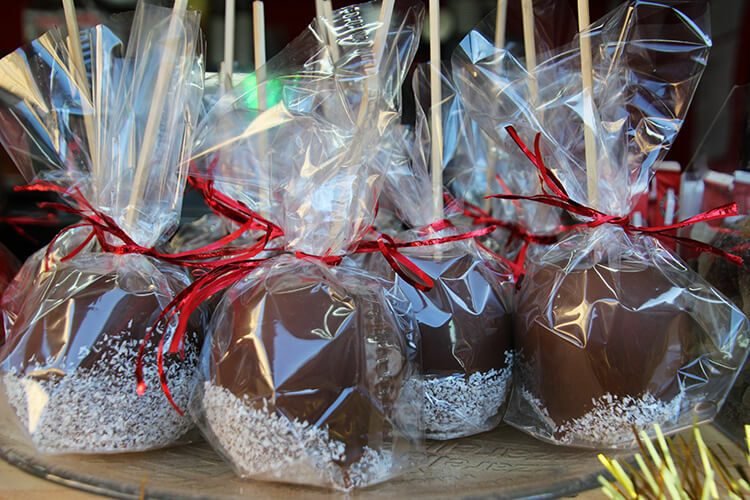 You truly know this Christmas market intimately. It sounds wonderful. I just toured the chateaus of the Loire Valley in all their Christmas splendour and they were amazing. What a wonderful way to experience Christmas and its markets. I was in Athens during the Christmas of 2014 and I really liked the sights and scenes there. I didn’t know Christmas isn’t commercialized yet in Venice. I think Christmas markets are always the best part of winter travel to any European city. The best I’ve personally seen so far is the one in Vienna. This one doesn’t look bad either. – it sounds like really big (or rather, a long one) though at 130 chalets! I’d definitely have a hard time deciding on what to try/buy if I were there just for a few days. What more when you have stalls from different countries too! Christmas has something that no other time of the year has…a common festivity the world over. We have Christmas decor and festivities in India too. Apart from Diwali (our biggest festival), I think Christmas is when you see the most color and lights everywhere here as well. What a wonderful place to spent Christmas time! The Christmas markets are truly amazing and the Hungarian Chimney cakes are sooo yummy!! I\’ve explored many Christmas markets in Europe, but haven\’t had the chance to visit the Marche de Noel yet. Will add it to the list for next year. 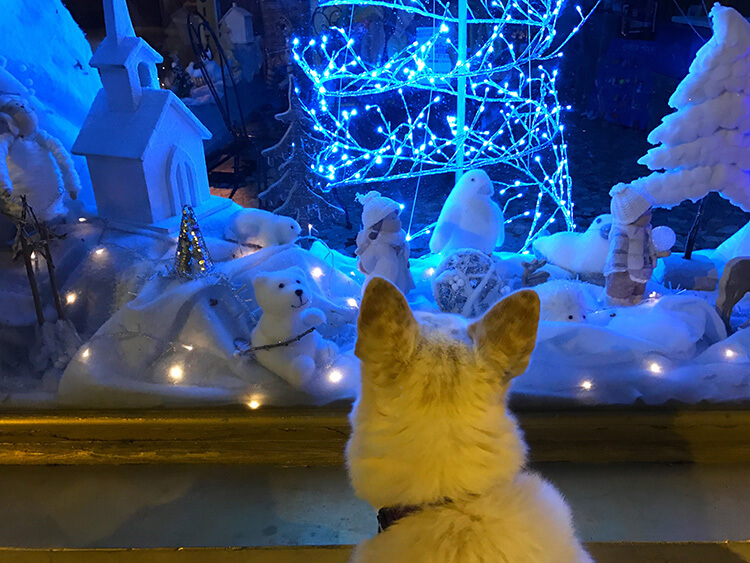 It\’s always difficult being away from home during the holidays, but hopefully the new traditions and excitement of the festive atmosphere in Europe were an exciting alternative to keep homesickness at bay.